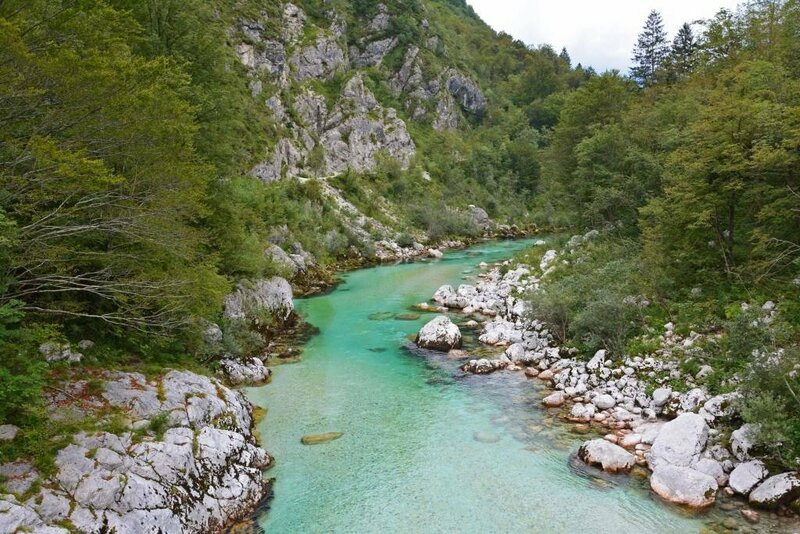 The Soča River, characterized by its vibrant emerald-colored water, flows through western Slovenia and into northeastern Italy. It becomes known as the Isonzo River in Italy, where it terminates at the Adriatic Sea close to the town of Monfalcone. 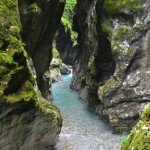 The source of this 86-mile (138 km) alpine river, often called ‘The Emerald Beauty’, lies in the Trenta Valley in the Julian Alps. We got our first peek at this natural beauty following a very curvy drive through the Alps on the Vršič Pass. Sure, this river is gorgeous to look at, but the best way to experience the Soča River is to go whitewater rafting in Slovenia! The Soča River Valley is a place for nature lovers and adrenaline junkies. The popular activity hubs of Bovec and Kobarid attract visitors from all over Europe and beyond who are looking for adventure in the Alps! Activities such as kayaking, whitewater rafting, canyoning, hydrospeeding, and paragliding are most popular in this region. We’ve been whitewater rafting a few times back in the States and couldn’t wait to take a trip down the refreshing Soča River! 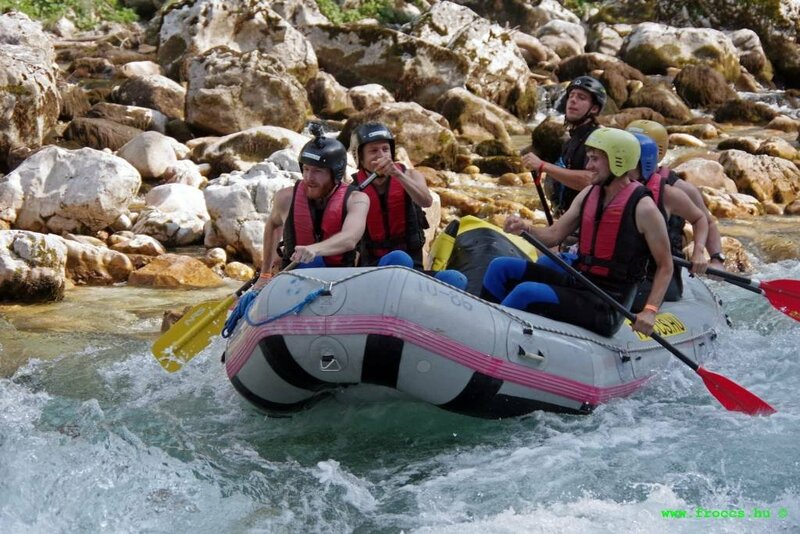 Though it was an extremely hot August day when we went rafting in Slovenia, the water temperature was frigid! 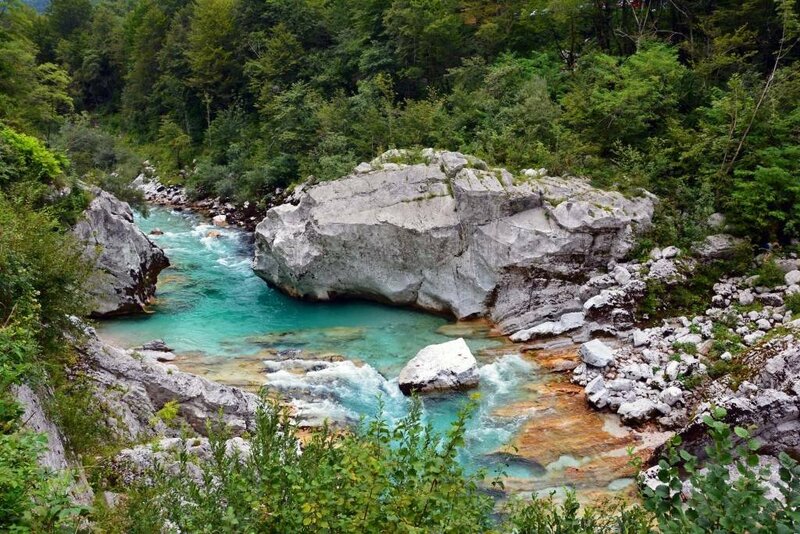 The water of the Soča is quite chilly even during the summer months, at less than 60 degrees F (15 degrees C). Thank goodness we were provided with wet-suits! Because it was so hot, we all opted for sleeveless wet-suits, which turned out to be a very good idea. 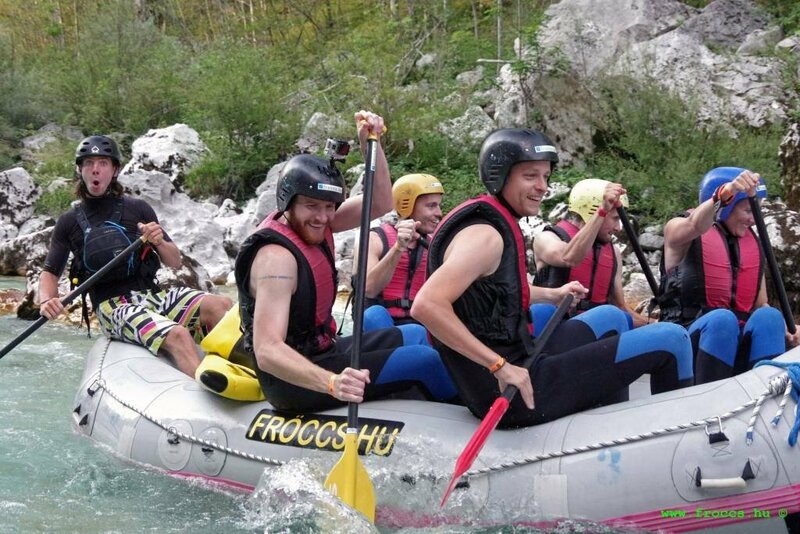 We booked with Fröccs in Bovec for a 3-hour rafting adventure! The adventure on the river was only about an hour and a half, as some of the time was spent suiting up, driving to and from the river, and getting our rafting safety briefing and instructions. That whole process was a little long, probably just because it was so stinkin’ hot out, so we were grateful to finally get in the frigid waters of the river! The water levels were a little low due to lack of recent rainfall, but we still had a crazy good time with several class-two and -three rapids throughout the course of our river adventure! Our guide did an excellent job navigating the rocks and the rapids, giving us precise paddling instructions to keep us safe and upright! There were many other boats on our tour, including several kayaks with brave individuals willing to navigate the rapids on their own. Honestly, some were in a little over their heads, figuratively and literally. With smiles plastered to our faces the entire trip down the river, we can definitely say we had an excellent time! There were a few opportunities for swimming in the calmer sections of the frigid waters, which we all took advantage of. Sam even thought it would be a good idea to jump off an enormous rock, which required climbing metal foot-holds bolted into the side of the massive boulder. Our goofy guide, the refreshing water, and the surrounding breathtaking scenery provided us with fun memories we won’t soon forget! 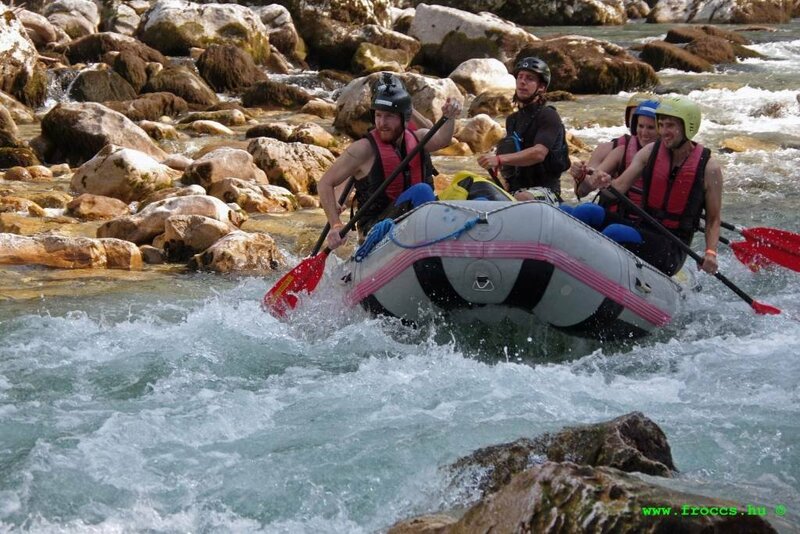 We strongly recommend you put rafting in Slovenia on your itinerary for your next visit to western Slovenia. We’d like to thank Fröccs for providing us with a complimentary rafting trip in exchange for us sharing our experiences with you. All copyright photos are compliments of Fröccs. Book your next adventure with them and they’ll provide you with a link to purchase affordable memorable photos from your trip. They also offer canyoning, ziplining, tubing, and hydropspeeding. Fröccs is conveniently located in near the Tourist Information Center in the heart of Bovec. Wow…. photographs are awesome. And you really inspired me to be there, the place is awesome. I have done Water Rafting in Ganges in india and loved every bit of it. I did rafting just once and loved it. 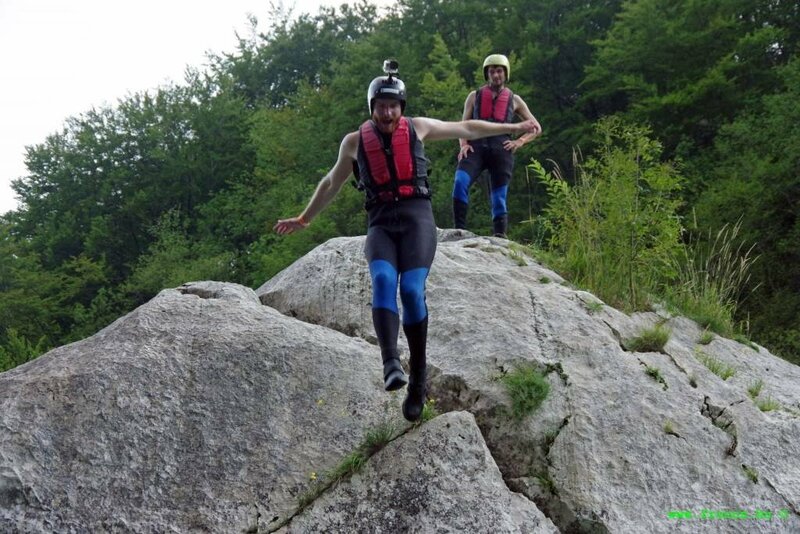 No doubt Soča River is the perfect place for doing it. Beautiful place and stunning nature! Just once?! Time to go again! Soča was absolutely perfect; not sure we could beat the scenery elsewhere! Wow that water looks so inviting. Oh those stunning views! Such a great adventure. I’d love to try white water rafting! It was quite the adventure… you should try it! That water looks so beautiful and inviting! Shame it’s so cold! What a fun adventure though! 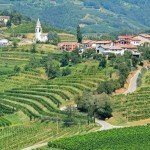 We’d love to visit Slovenia someday! It was so hot, the cold water felt amazing!! Otherwise, you’d never catch me in water that cold! So much fun though, I imagine you’d very quickly forget about the cold water and just enjoy the adventure! What a great looking river! The color of the water is beautiful. 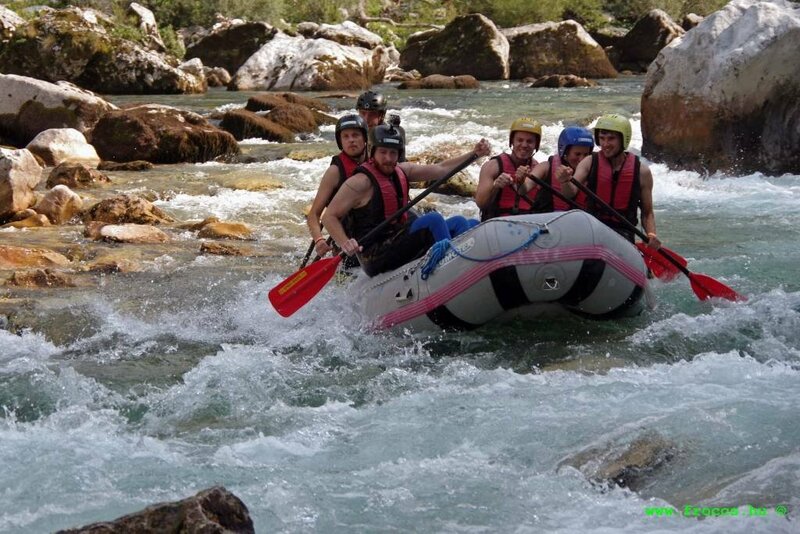 White Water Rafting is one of those things that give a great adrenaline rush! And with wonderful scenery its even better. 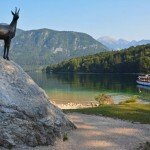 It looks like a great activity to do in Slovenia. Although I haven’t done rafting before and after seeing your photos it is something I would love to try! The route looks scenic and it sounds like a lot of fun. Thanks for sharing! You should definitely give it a go sometime. And this was for sure one of the most scenic areas we’ve ever been rafting! Great adventure! Rafting looks like a lot of fun. 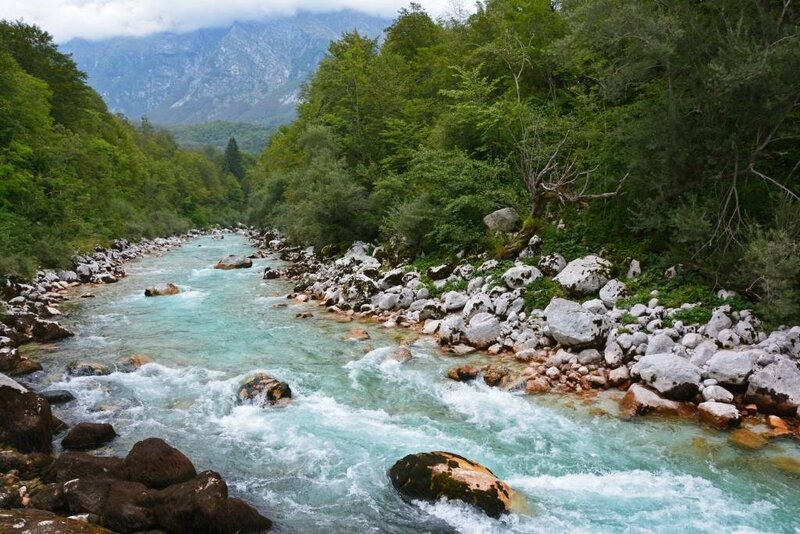 I must admit that The Soča River is really beautiful with its emerald hue. Nice! 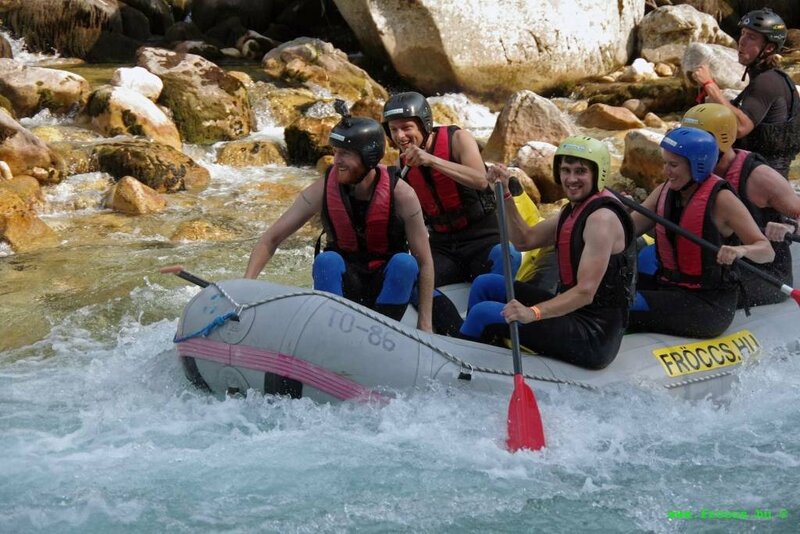 Whitewater rafting is sooo much fun! We’re not too adventurous when we travel, but this is one of those activities we can’t pass up! Just went white water rafting in Ubud, Bali…but the water was no where near this! How stunning it must have been! Can’t get over how clear and vibrant it looks! I didn’t know they had rafting in Bali… hopefully headed there early next year; we’ll have to check it out. And yes, the water was ridiculously clear in Bovec! I am too, but again, it was so dang hot, the water felt AMAZING! !